X Rebirth 4.30: This update brings a number of improvements for controlling the game. 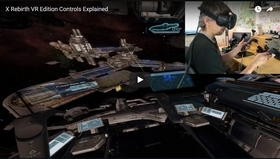 HOTAS and Joystick improvements that we made during the XR VR development have been back ported to X Rebirth and come along with a default profile for some of the most popular sticks. Also controlling the game with gamepads got a lot easier thanks to a number of new features developed for X Rebirth VR Edition. Click here for a full list of features.